Typically, I like to get my blog posts typed the night before, but I was enjoying my day off a little too much, shame on me! The phone number is (727) 807-3370. Backstreet Salon is co-owned by Carrie Bacon and Cheryl Freyer. I've known Carrie's husband Doug since... oh sheesh 2009, so when I found out she had opened a salon, I'm sorry but I got really excited, probably more than I should have. I love when people open new businesses that are local! 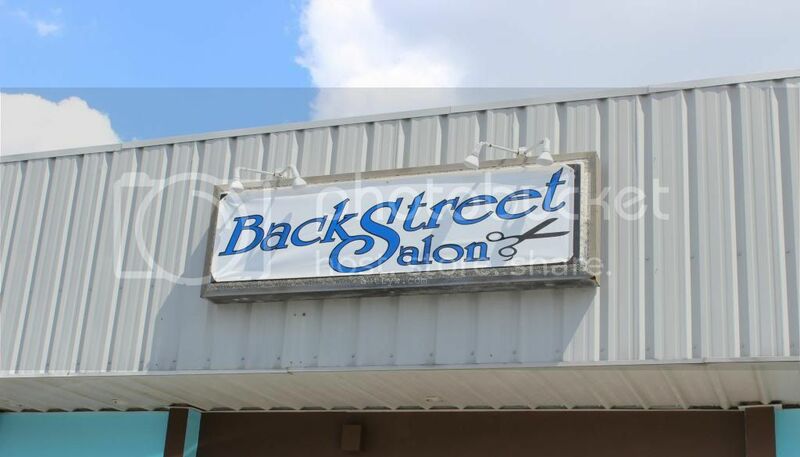 Backstreet Salon has only been open for about two weeks, so congratulations to them! I'm a huge person on appearance, when it comes to packaging or how a place looks on the inside. I'm not too worried about how places look on the outside to be honest. The inside of the salon is absolutely adorable. The walls are a sky blue and the partitions are a darker blue. 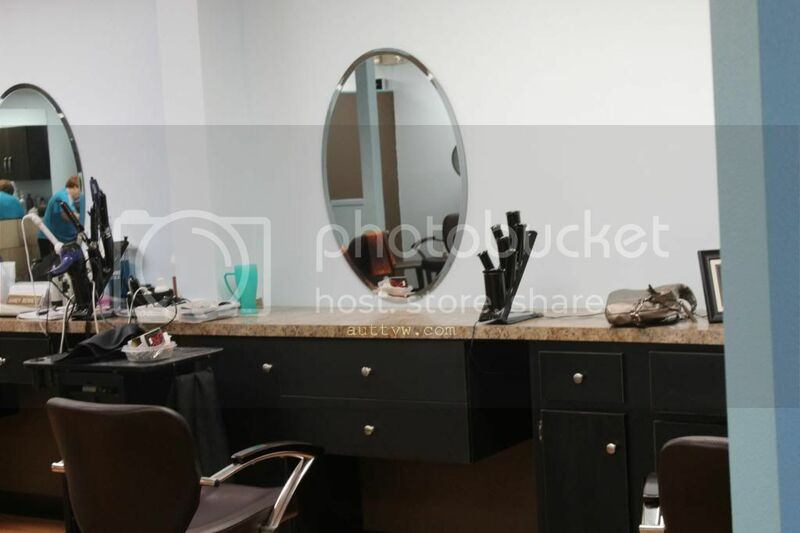 Each person has their own station, which is how it should be and typically is when you go into a salon. Let's take a side step and talk about the entrance. When you walk in on the left is where the receptionist would sit. They've got a cabinet that has some products in it. The chairs, oh my god the chairs! I freaking love them! I so want these in my house. They're extremely comfortable as well! Kudos! Most salons have really ugly chairs that are uncomfortable, or cute chairs that are uncomfortable. 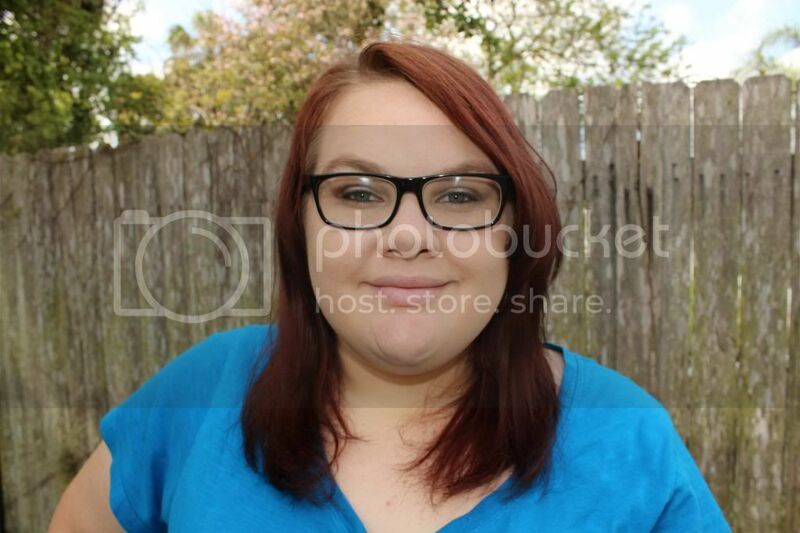 Here is my before hair. It has been a year or more since I had gotten it cut. Insane right?! The last salon I went too, to get it cut did a horrid job and I've been trying to grow it out since then. Shameful. Anyways, Anyways. Lets get back on track! This is what you see as soon as you walk in. 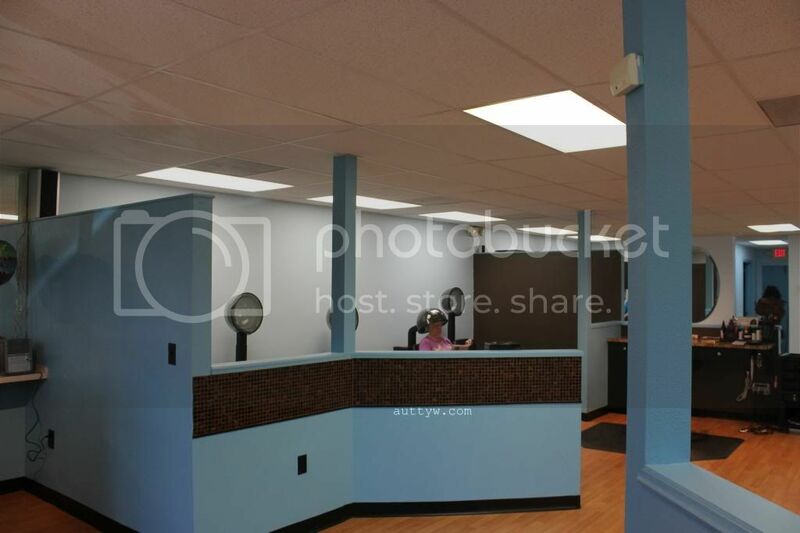 The receptionist's desk is on the left, but here is the main salon. Now you can better see what I mean about the two little blues. Can I just say how much I love brown and blue together. Oh my goodness! It is one of my favorite color combinations! 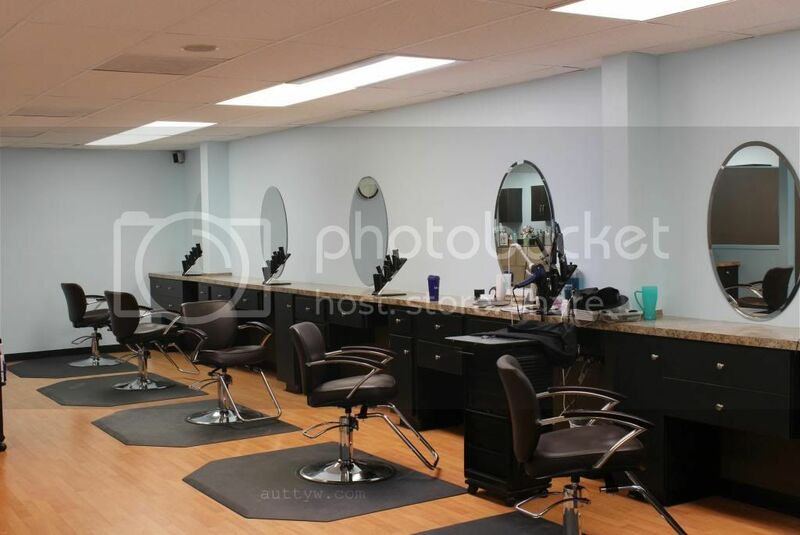 The Salon itself is VERY well lit, which is extremely helpful to not only the stylist but too the patron as well. When I went in there were 3 stylists working. (Is stylist even the proper term to use? Feel free to correct me) Carrie, Cheryl and Sandy. I believe they have enough areas for 7 people. The one thing that I paricularly like is that each piece of equipment has it's own place ON THE COUNTER! 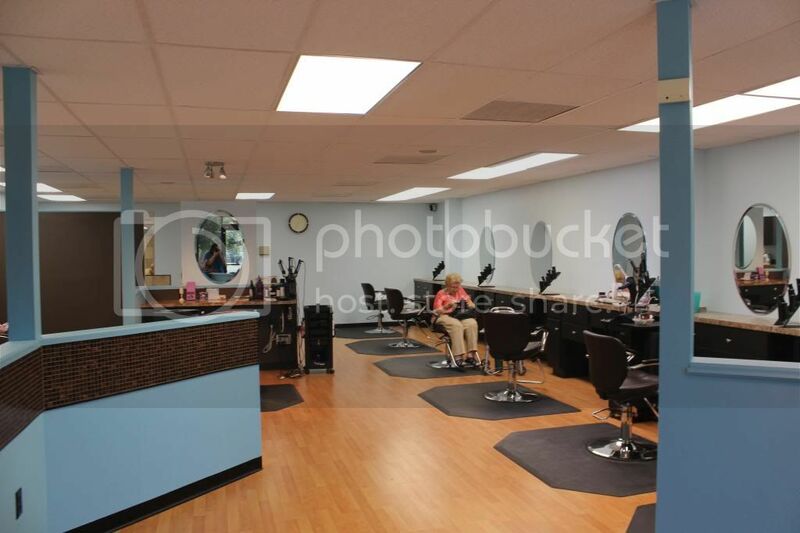 I've been to a few salons where they're pretty much kept in containers on the floor. Not good, so I was very pleased at how organized and sanitary they are! I didn't get a better picture of this area which was a my bad. I'm sure we all know what these are so I shant go into much more detail. On the other side of the wall though is either a coffee pot or a kettle to make tea. I'm not sure which, but that's a nice touch! It's always that little something extra that puts you ahead of the game! Here are the chairs! This is the part I was worried about, a lot of the time the chairs are a bit uncomfortable for me, because I have wide hips. Boooo. These chairs are wide enough for my arse with extra wiggle room. That is a huge detail for me! Here is the hair washing station! You know when you go to get your hair washed and you have to sit in a kind of uncomfortable position, let me tell you, holy crap. These chairs recline! Whhhattt??!!! I also had a heart attack when I started to scoot down the chair and is went back, I thought I broke it. Lol. I'm such a dunce sometimes. I like that this section is kind of private from the rest of the salon. I don't know about anyone else, but having a whole ton of people watching me get my hair washed makes me feel weird, so I'm grateful that this is kind of secluded. Now, with all of the out of the way let's chat about my experience. Typically when I go into a salon, I'm nervous, scared....pretty much in a nutshell I'm a nervous wreck. I've almost cried a few times, that's what happens when you have one too many bad experiences! As soon as I walked I felt calm, I wasn't nervous or anything, which for me is an awesome thing! 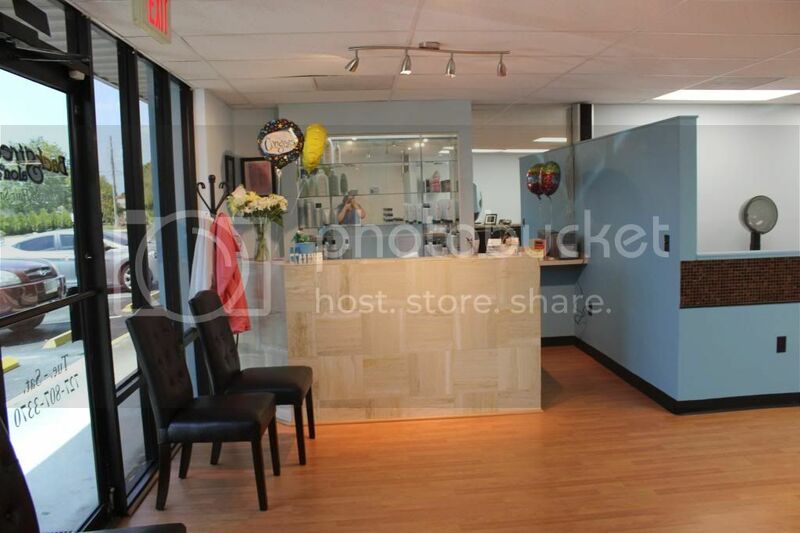 Backstreet Salon is a very inviting and welcoming establishment. They've got good music playing, but it's not loud enough where you can't hear yourself think, the volume is at a very moderate level. Carrie is the one who cut my hair, so when we went back to the hair washing station and she started washing my hair, oh my lord. Okay, remember when you were little and your Mom used to wash your hair?! That is EXACTLY how it was. No joke, I could have fallen asleep, that's how relaxing it was! It that weird to say. Now, I typically give new hair stylists, vague descriptions of what I want. 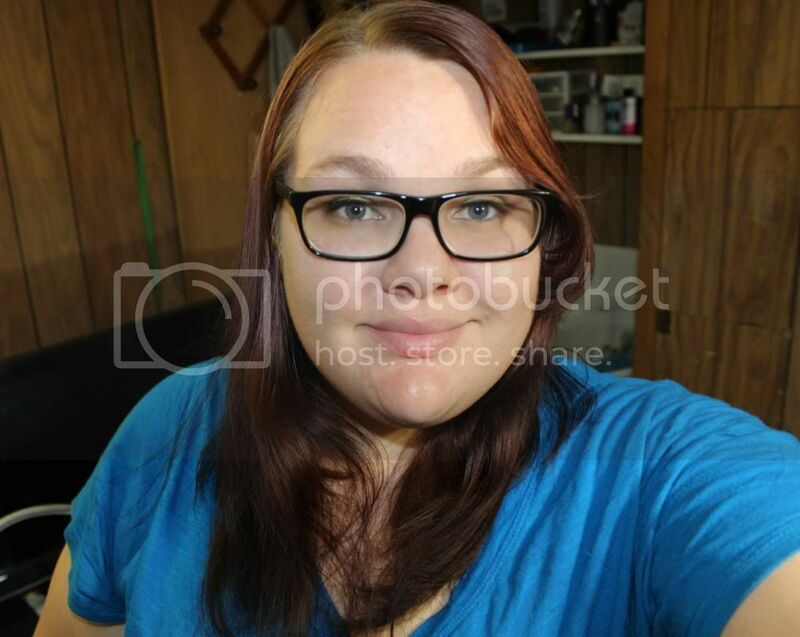 This time I wanted the ends of my hair trimmed, layers added and I wanted to keep my side-swept fringe. I got everything that I wanted and you can tell that I actually LOVED my hair cut because I wore it down at work that night. I NEVER wear my hair down. 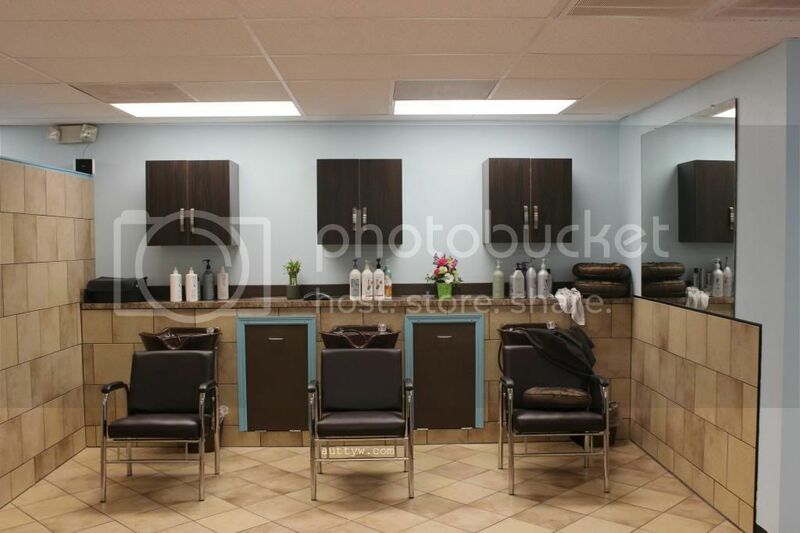 Looks like a great place and its great to hear your happy with your hair too. I feel the saaaame way about haircuts, girl. Yours looks great though! Thank you! I tend to tell the stylist that I like my hair cut then hide it in a pony tail until it grows out LOL. Thanks! I'm really pleased with it! It looks fantastic! Great review on the salon, too.